This demo is intented to show you how to make a grayscale/color image hover effect with HTML5 and jQuery. To achieve this effect before HTML5, two images are required: a color and a grayscale version. Now HTML 5 made it easier and faster because the grayscale image is generated from the original source. I hope you will find this script useful in your design such as portfolio showcase, photo gallery, etc. The jQuery code below will look for the target images and generate a grayscale version. When hovering the image, it will fade the grayscale image into color. AWESOME! Exactly what I was looking for! Thanks a lot! Doesn’t work on latest Chrome 10.0.634.0/Win7. Images don’t show up until you hover on them. I have this effect on my portfolio site, using the pre-HTML5 technique. Looks like I’m due for an update! Awesome tut, thanks! Thank you!!!! I was just looking for an effect like this to use in my soon-to-be-redesigned portfolio!! Works great on my XP / Chrome 8.0.552.237 – and I agree, it’s AWESOME! Nice article and thanks for sharing! On mouseover and mouseout events, maybe the animate duration value should be decreased a bit? This way you won’t have to wait so much (1000ms) to see the effect. Can’t seem to get this to work. I tried to just run the demo on my site and the images get duplicated, one on top of the other, where the top one only appears when scrolled over. Any ideas? That looks useful and the transition isn’t jarring. Expectacular efecto con las imagenes, creo que muy interesantes!!! Wouldn’t it just be easier to do this with CSS? Nice technique! But for less lines i might still do this with a simple sprite with b&w version / color version and a bit of CSS. That’s a nice, subtle transition to colour too. Thanks for the article. Really great technique. Thanks for sharing! @Olli – It is possible with less lines but not only would it be more tedious creating the sprites in comparison to a single color image, the accumulated file sizes for the images would be greater than the technique used here. Basically, it would result in a higher file size over line count, impacting — though minimal — page load times. Or you could use an svg filter without the need to tax the cpu (well if you had heaps of images) looping thru pixels. The animated effect is possible with this only not with CSS. Nice effect. Would be cool to if grayscale was applied to images before they were shown. Nice technique! Thanks for sharing it. It can enhanced by applying grayscale to images before they were revealed. Can’t get this to work, pretty sure I did everything correctly was anyone else having issues with this? That is cool man, really loved it. &Would definitely love to use it. I’m using my offline xampp blog, and tried to add the script before the wp_head function…but it still doesn’t work. i’m not sure if that means copy and pasty the jquery.js in the same folder or not? Updates: I copied the jquery.min.js content and pasted it into a new document. By changing that I realized that the images turn grey but no effect when I rollover them….why might that be? This is awesome, I was trying to do something like this using timThumb all last summer. Much easier and effective, thanks for sharing. that’s not exactly true, it’s possible to create a grayscale (or duotone) copy of your image with PHP. ofcourse this means storing another physical image on your server, but there’s no manual action needed. think this could be tweaked to to show a sepia preview on a photographers’ proofing site? Have tried everything, but still can’t get this to work. Can someone post the actual HTML code used to display the images on the page? I think I’d use a webworker to generate grayscales. On slower machines and/or larger images, it may delay loading the page too much, and webworkers are non-blocking. They don’t work on all browsers, but the same is true for canvas, so I think it’ll be better in the end. sweet. i just recently came across this photo site: http://olivermuc.com and wondered how that effect was done. thanks for the insight and code! Errm, where’s the HTML5? The demo preview is xhtml strict? It’s cool in theory, but seems far too processor intensive to be feasible. Doing a sprite is going to be faster all around with, of course, the exception of generation time. If you want to automate this process, you could use a server side script to generate and cache a color/bw sprite for you. HTML is the solution to all browser incompatibility. CSS3 is another great work. All browser should standardize in order to have a better surfing experience. I think good work! This effect is simple and it easy to do. I coded kind of a similar effect with the GD library some PHP and jQuery. The website is coded for WordPress, so there was no ability to use sprites. ‘Cause each team member is displayed by the post_thumbnail function of WordPress. Maybe your effect is a bit faster than mine. While very cool, in this day and age of increased efficiency and faster production, I think it might be quicker to do the three clicks in photoshop to save a greyscale version rather than code all this. I’m not sure what the load-difference would be for the average user. If the code takes less time to process than loading a new image, that might provide some benefit. Sorry but I don’t get where the HTML 5 link comes in? HTML 5 is not a requirement for this to work – the demo proves that since its using xHTML 4.1. @Matt Hackmann – maybe you could include some delayed loading so the filters are applied to the images as they need to be, based on the user scrolling, to improve the performance? However wouldn’t it be good to make the grayscale images in Photoshop or another graphic programme because it gives you much more control over how the grayscale image looks. Check out this site! i find it very useful. Go ahead ahead and put the link bellow that i provided into your address bar. Here you can learn webaite ideas that other users have posted, and share your own ideas. No signups, no registrations, no fees! 900% free! Help please I add all the things you specified above but the hover effect is still not working. This is the url: http://whitemagicdemo.blogspot.com/. Awful lot of work for a simple thing done in CSS. Looks like another “throw jQuery at every problem” solution. No hover when viewing on an iPad. Cool effect, very useful scripts. thanks for sharing. Is there a link to the full HTML code? Sorry, but how exactly is this HTML5? It’s using an XHTML 1.0 Doctype rather than the HTML5 , nor are the meta or script tags marked up using HTML5 syntax. Likewise you’ve used divs rather than section tags etc. I’ve viewed this under Fx, Chrome, Safari etc. Are you using something server side to push it out as XHTML1.0 syntax? If not then you shouldn’t be pushing this out as an HTML5 tutorial. this is great thank you… for much..
the demo is pretty good & also help me.. This is just great. Saves a lot of time. Thanks! Very nice and smooth effect ! great effect for photo galleries and even for bloggers.I found it very useful as i was designing a portfolio site so it helps with jquery scripting. Your can improve the speed and maintenance by using a var and/or jquery chaining. If your call each time $(‘.item img’), jQuery have to find the selector each time. By putting it into a var you make jQuery select just once. This article should be renamed and it’s description amended as it is very misleading. I have looked a number of times at the example page and cannot find one piece of HTML5! wtf? I did found a way to express my self better. I wish compatibility with Lightbox JS. Such a great Article.. My first HTML5 try!! for those who want the opposite effect just change the opacity. @tejas I just made it work on a localhost template for wordpress. Are you targeting the correct images? A nice idea. Thank you. thanks for this tutorial. It’s great and I can’t wait for an opportunity to use this beauty on a site. Thank you for the consistent quality in content and sharing one of your favorite post. i will try this info thx! thank you for post. it’s too good. expect more latest stuff about HTML5 n CSS3. Wow what a great tutorial. I used this a lot in my projects. Nice and easy! Would it be possible to give the grayscale version of an image a monochromatic overlay? I’d like to use this but I’m having the ever so popular mootools/jquery conflict… is there a way to load this where it won’t conflict? imagebymac.com – i’m trying to get the top right myProject rollover to work with it. I’d like to use this effect with my portfolio images but can’t get things to play nice. Any advice? Go ahead and contact me/reply. It’s probly a noob effect with getting the two to work, though I’ve done it before using other jquery scripts… but can’t with this one. A great tutorial – I will certainly be using this effect – thanks! It would be great to use it in our next project. Really nice post to share as well with our web designers. where can i get the code ??? where can i get the code for my blog ???????????????? What an incredibly elegant solution. Thank you! It is now supported by IE9. Not to brag about, I still love firefox and Chrome. However, this measure taken by IE version 9 is going to benefit all designers not to worry about inability of certain feature which was not supported by IE. Good job with html and js. This script looks great and exactly what I’m looking for. Sadly I can’t seem to get it working on my wordpress powered site http://www.brentdickens.com. It doesn’t work on the dynamic thumbnail images and half works on the main image which is static and part of the page. That image does the grey image production but not the rollover. Any ideas? I would love to get it working. Check my reply for ideas. dude i was having same problem, if you have multiple images, remove all, and keep only one, plus the image should be in the same domain (not even sub-domain!) and it will work. the restrictions for domains and multiple images are still not known to be why and will update as i find something. Although HTML5 have lots of new features that are never before, yet I think that Flash has its strong place in web designing that will not be replaced soon by any other language. What do you think? When I load the page in FF 4.0, the image is not visible; when I hover it fades in. I’m not getting a grey-scale image on load (using the default code as is). Not only works on IE7. Did anyone find a way how to do that work on IE? In my case the images apepar in grey scale only. When I hover over the image nothing happens. I tried with exactly the same code as per demo just changed the images. Plz help. Have you used Internet Explorer? The trick shown works on browsers that are HTML5 complliant. Internet Explorer 8 is not. Is there any way to trigger this when hovering over a separate div? For example, if the image is under a div with a z-index of 9999, can the effect be triggered when the cursor moves over that div? At the moment, as soon as the cursor is over the div, the image fades back to B&W. I am Japanese, and I am roro who cannot talk about English. I’m sorry if there is a shortcoming. It was not possible to use it well on my site though this script was able to be used well in the demonstration. Could you teach be good when using it only for the link of full page images to adjust very? We will wait for the report though it knows on your precious time. Really amazing effect. I was searching for this effect for long time.. Thanks Admin for this tuto. I tried this out, my original image (that is meant to be black and white) doesn’t appear at all, but when you mouse over it, it becomes visible in color. Have got this working fine, thanks for your help. This is awesome and it works flawlessly for me in chrome, but I can’t figure out why mozilla’s not displaying it. My images load for a sec and then disappear. The demo works in all browsers. Can anyone help? Cool I will have to try this out. I am sure it will be faster than creating two images in Photoshop, one grey the other color. Thank you so much! This effect works wonders, and so easy to use. I read a few comments and people were experiencing problems with the grey scale not appearing but when works when hovered and it happened to me at first as well. What I did to fix it was copy the script from the demo page. Somewhere along the lines, the coding must’ve gotten jumbled up. how to use target image? What DOES work in any IE version? We should just stop supporting it. eventually MS will either comply with W3C or user will eventually see that things look like crap and other browser actually work. Btw Awesome tutorial, Don’t mean to troll. but effects like these are awesome and that it wont work only in IE… Come on! You actually can get it to work in IE 6 and up by using a ie’s grayscale filter. Thanks for the fix. Worked perfectly for me. 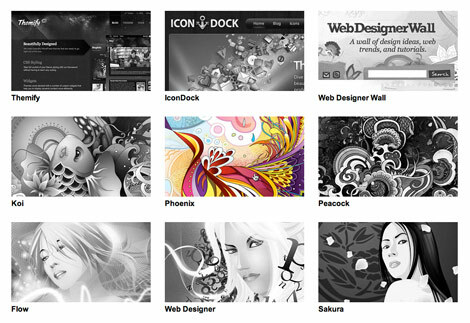 It is HTML5 as it generates a canvas grayscale image. How is that not HTML5? I just wanted to construct a simple word in order to thank you for all of the precious facts you are showing at this site. My rather long internet research has now been honored with reliable information to share with my friends and classmates. I ‘d state that that many of us visitors actually are very much endowed to be in a really good community with very many outstanding professionals with great suggestions. I feel truly lucky to have encountered your website and look forward to really more fabulous times reading here. Thanks a lot again for all the details. How could one reverse this effect = color to grayscale? Well, it would be easiest to use 2 images, which is what this works around. I see no reason you couldn’t apply this in reverse… to have it switch from color to gray onMouseHover/Click, etc. It would also have to be in color, rather than grayscale onLoad… I believe. Alexis Ohanian, co-founder of Reddit.com, talks about the value of college education and the “dire need” for skilled labor in the U.S. Higher education fails to provide students “good value” for the money they and their families spend, more than half of U.S. adults said in a Pew Research Center survey. Ohanian speaks on Bloomberg Television’s “InBusiness With Margaret Brennan. Thanks , thats really an awesome post . Is it possible to use this in a fluid layout, when the images have to resize to 100% of their containing element? I’m also looking for a solution for images set at 100% in a fluid layout. Does anyone have any ideas? Where’s the HTML5, and why wouldn’t you rather do this server side? I enjoy you because of each of your effort on this web page. Debby really likes carrying out investigations and it’s obvious why. My spouse and i hear all of the dynamic medium you give functional guidance by means of the blog and as well improve response from some other people on that situation then my child is now learning a lot. Take pleasure in the rest of the year. You’re the one doing a stunning job. 1: On Hover on image it is converting to grayscale and on mouse out it reverts, but how to work around if you want whole div to be active (hover over anything in the div, like text or anything containing in the div) and the image shall animate.?? 2: Images hosted in same directory are only working properly, but when images hosted on other site/domain are linked to img, its not working at all! It works very nice, indeed! How may I do it in a way, the the exact image is detected, and it senses the hover exactly over the appropriate image? hi, sorry but I cant get it to work. i have followed the rules on putting the js in the head tag. but its inside an anchor tag. its not working in chrome or firefox.. its only working in safari..
very very helpful and much appreciated, fits in well with any div layout, no need to adjust size of divs or images. I’m using the same method on my service, I’m getting Uncaught Error: INDEX_SIZE_ERR DOM Exception 1, can any one help? I had the same error in chrome and safari. I was calling the function in document.ready instead of $(window).load as it is in the example. I changed that and it works fine now! I removed CSS opacity to “0” then working. But how to change Grayscale to Green colored scale ? Is there a way to adjust the greyscale? It should be a bit lighter grey. How can I adjust this?? how do i use this in tumblr? Thanks for your work. Nice effect. …but this unfortunately doesn’t get it working. Is there any intention of making this compatible with anything but latest gen browsers? OMG! This is the must awesome image over script I ever seen! I cannot believe the transition of colors is in the code. I will definitely use this for my portfolio. Thanks a lot! This works really well. Very impressive but has anyone noticed that it shifts the images 30 odd pixels to the right? Awesome tutorial guys! This is the best implementation I’ve seen, along with very tight code. Cheers and thanks! Could someone tell me why this moves my image over and down? I’m trying to implement this into my custom joomla template to a dynamically generated image tag. I have several images in a row and the first image is is pushed down and to the right. Any help would be appreciated! Brilliant! I’ve been trying for hours to fix it in IE, and the you do it in such a simple fashion. Thanks. Great! Many thanks for this awesome fix for IE7/IE8!! :-) It’s easy way! Anyone figure out the pixel shift bug? I also had a pixel shift bug in Firefox 9 and IE 7 where the images were shifting right. and my weird right shift was fixed. Great tutorial indeed. I’ve used this on a project to make all images grayscale when loaded and add color hover effect. before the ctx.drawImage() function so the page will wait until the images are loaded, but this just draws a transparent image. David, thanks for the IE9 or less change to the script. I was trying myself and decided to look for the original post. with firefox 10 there is a short black between grayscale/color transtion. How do you tag your images for this to work? why do the pictures fade completely away? for me they don’t go to grayscale. they disappear. For this I might be able to help out, could you paste your JS code? That could help resolve the problem (if not already resolved). nvm. i guess it had to do wtih opacity. THX! Hi Elijah – I’m having an issue where the images start 0ut in Colour and fade away to nothing. Please could you post what you did to correct this issue? i still get the color pop. any idea how to change that? i also noticed it happens on yours as well. I copied the code to test if it works for me as well, because sometimes there is still some code that has to be added in order for it to work properly. After that, I change the code so that it fits my design. This should turn the pop into a smooth fade. Can you explain that a little bit more? i want the images to go GRAY on mouse over . else nothing should happen . could i apply these to a wordpress theme? I tried this and works dam well. Awesome script. i tried everything and it doesn’t work. nothing’s changing. can you summarize it step by step please? I recently made a change to my template on dreamweaver and updated the template to the page where i was using the grayscale and now it is not working . It is saying that the jquery.min.js is not on the local disk do you have any ideas on what i can do to fix the problem? It looks great but I have two problems. The site is loading with the images in colour and then turning to greyscale. The images are now pushing down and covering my descriptive text below. The most sexiest website and sexiest tutorials and scripts. I’ve been trying to get this code to work on my Tumblr because I really dislike the random splash of color everywhere in my very minimal theme. I want all the images I reblog to be black and white, and when hovered over to be color. Is that possible? I’ve tried several times and I can’t seem to get it right. this for me is very simply and easy to use. however thanks for this interesting post! The script works GREAT on FF11 and IE9, really superb! Any idea how to change the script in order to work with bg-images? I have used HTML5. This is the latest version of HTML. It will help us in our working. Thanks a lot. Any idea how to make this responsive with bootsrap framework? good n i like u information…. hi, I’m having a problem, my image doesn’t go to color it stays in b/w. Hey, nice tutorial! :) I just have a question regarding the jquery.min.js? Do i have to download anything just for that to work? Or can I simply use that? Hello! :) Nice tutorial. I just wanna ask if I need to download anything for this to work, regrading the jquery. Or I’ll just simply copy the …… ? These two lines did the same effect for me. USE THIS ONE IN YOUR CSS! The feature on your site does not work in Firefox or Internet Explorer. Anyone know a work around? can it work with magento framework ? if yes how work help me any one ? This is great but it doesn’t work on chrome locally. I didn’t try it on a web server, but it does work on firefox and other browsers. What could be the problem? If you did a “save page as” it may have saved the generated greyscaled images and messed things up… I know firefox saves canvas stuff done to DOM for some reason. This script does not work if you want to load images from different servers. A security warning is thrown. Anyone know of a workaround? Useful sharing. 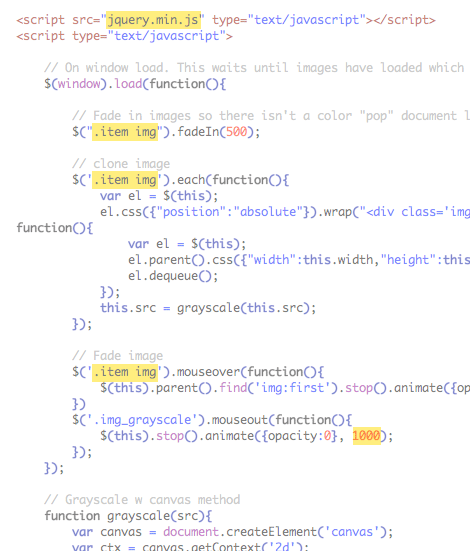 Very easy and helping script for grayscale image hover. Thanks for sharing. wear do we paste the code in the html? It does not work in internet explorer 8. Is there any way to solve this problem? This script does not work if you want to load images from different servers. I tried this code. but in firefox and chrome the images are not shown at all. In internet explorer the images appear but no gray effect. I copied the code from view source code and tried to run it locally. I changed the path of the images also. It isn’t working for me :( help?? where am i suppose to put this? like under what i am so confused :O please help!! Is it possible to make this work on tumblr? Hi I’m trying to use this code for my tumblr? I’ve tried to put this code in a lot of areas in custom HTML but none of them seem to work? What should be my target image and where in the HTML do I paste the code??? Help?!? How do you this on tumblr when customizing the blog? Like do you jus tpaste into the html codes? This one looks much easier. Excellent ! It all worked in a jiffy ! Thanks . Hi, this is really useful and I want to thank you for doing this. I just havea question, how do i declare multiple instances of the image in the same line of code? for example, in the line $(‘.item img’), what if I also want to declare .logo, .articles, .blog… etc… how do i declare all of them in that single code? Do i have to copy and paste the code again? Thanks, this effect will look great on portfolio sites. Thanks for Your Tip, The demo works like magic. But My problem is that I am using WordPress and Its hard for me to achieve this. Any Help that will point me in the right direction, will be deeply appreciated. Oh yes…exactly what I need…You save my day..Thanks a lot…Really awesome!!! Is that work for the cross domain images ? I tested with the local image and it’s ok. But now trying to use from 500px website images, it didn’t work. By inspecting DOM , it say insecure to perform action. Dude , are you saying to me ? I just want to know the canvas can get the width and height of cross domain images. I didn’t say i don’t know how to applied to my site. Pls read carefully. i have a question, i’ve tried to implement it to my portfolio (offline), everythings i put it at the same order, just like you taught here, but what im surprised is i the picture are loaded correctly but the jQuery files wont load, i’ve tried the new version the old version and your version but still nothing is goin on.. can you explain more? That’s working for me and this is easy to use. Thanks for giving that nice and easy coding. Why is that it does not work on local and have to host it somewhere?